If you're a Leonia resident, you no doubt noticed that Congregation Adas Emuno was featured as the front page story of this past week's issue of the weekly newspaper, Leonia Life. 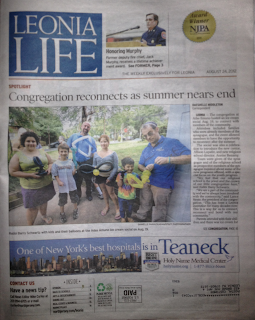 Dated Friday, August 24th, the article by Raeshelle Middleton is entitled Leonia congregation reconnects as summer nears end. You can click on the title to read the article over on NorthJersey.com site, or read it here. The congregation at Adas Emuno hosted an ice cream social Aug. 19, to connect with members of the community. Attendees included families who were already members of the synagogue, and the event allowed members to have the opportunity to reconnect after the summer. The social was also a celebration to introduce the new cantor, Allison Lopatin, and new religious school director, Annice Benamy. Tours were given of the synagogue and of the religious school as prospective members of the synagogue inquired about some of the new programs offered, with a special focus on the youth program. A picture accompanies the article, credited to photographer Danielle Parhizkaran, with the caption, "Rabbi Barry Schwartz with kids and their balloons at the Adas Emuno ice cream social on Aug. 19." Of course, that's the Rabbi in the middle, and over on the right is David Benamy, the husband of our new religious school director Annice Benamy, our new Youth Group adviser, and balloon twister extraordinaire! "We feel that our religious school is the jewel and the crown of our little congregation here," said Rabbi Barry Schwartz. "We are a part of the community and we've always been involved with the community," said Lance Strate, the president of the congregation. "This has been a Leonia institution for many decades now. This is a way for us to connect, reconnect and bond with our community." Parents attended with their children and there was ice cream for everyone with many different toppings to choose from. There were also balloon animals being made for the children and different types of arts and crafts available for them to participate in. "Anything a synagogue does is for its congregants, so it's not about the leadership or the professional staff but it's about what we can do for the community to make them feel more connected to their synagogue," Benamy said. "I thought it was a good way to introduce yourself to the temple. It looks like a cozy, nice and friendly congregation," said Richard Kaplan, visiting from Gutenberg with his wife, Myriam. "We were looking at the Hebrew school for our son Joshua. He is going to the third grade, and third grade is the time when you start formal religious training." The temple hosts different events open to the rest of the community throughout the year. At Hanukkah, the synagogue hosts another event open to the community followed by a Jazz concert, and there is also an interfaith Thanksgiving service. The synagogue is also planning a film screening for the award-winning documentary "Connected" Aug. 25 at 7 p.m. The film focuses on how all things in the world are connected and pays special attention the filmmaker's own experiences. Rabbi Schwartz expressed that the doors are open to people of all faiths who are interested. "I have three of my kids here ages 11, 14 and 20. I got to see people that I really don't get to see which is nice," said Eric Fisher. "I think it's a wonderful thing that they've done. We've been attending for 15 years. I think the fact that the congregation is expanding and the services that it's offering to all age groups is really important, because the kids are the future." And there you have it! Congregation Adas Emuno contributes regularly to life in Leonia, New Jersey, and to the greater Bergen County community. Shalom Cogregation Adas Emuno! My name is Alison Lopatin and I will be your student cantor this year. I am very excited to come and spend many Shabbats with you! I wanted to share with you a little information about myself. I am currently in my fourth year of Cantorial school at Hebrew Union College/Jewish-Institute for Religion, in the Debbie Friedman School of Sacred Music in New York City. Originally an East Coast girl, I'm from Fairfield, Connecticut and attended Wesleyan University as an undergraduate. After college I went West and attended the San Francisco Conservatory and sang opera around the Bay Area before beginning my Cantorial studies at HUC-JIR. I was a student cantor at Temple Emanuel in Roanoke, VA for the last two years. My hobbies include crossword puzzles, cooking, zumba, and of course, Jewish music! I currently live on the Upper West Side. And we join together as a congregation to say, Welcome to Adas Emuno, Alison! We look forward to a melodious and harmonious year with you! We'll begin with a Havdallah service in the sanctuary at 7:00 PM, then hold the screening downstairs in the social hall at 7:30, followed by a discussion. Light refreshments will be served. This event is free and open to the public. See our previous post: Connected Screening — Save the Date! By the way, if you order the book through the above link, or order anything through the Amazon search box over on the left, Adas Emuno will get a share of the profits. So if you're going to order anything from Amazon, why not do it through us and help to support our congregation? Rabbi Schwartz's latest book, Judaism's Great Debates, is a well-written and accessible guide to some of the major disputes in Jewish history, and as such, serves as a great introduction to this essential element within the world's oldest monotheistic tradition. The book presents us with 10 debates in all, stretching all the way from Abraham's argument with God to spare the citizens of Sodom and Gomorrah, to the differing views on Zionism of Theodor Herzl and Rabbi Isaac Mayer Wise at the turn of the 20th century. Each debate is presented in a concise form, with emphasis on the dialogue, whether real or virtual, between the disputants. And most importantly, each debate is presented with an eye towards the continuing relevance of the issues under consideration for contemporary life. The debates are a part of a living tradition, and are in their own way reflective of the contradictions inherent in the human condition. Each of the 10 debates is thought-provoking, and provides an excellent opportunity for discussion and self-examination. But I do have my favorites. The 3rd debate, between Moses and the daughters of Zelophehad is remarkable for its relation to women's rights, the fact that it implies flexibility in regard to Mosaic Law, and its connection to the question of intermarriage. Chapter 4's debate between King David and the prophet Nathan is a sobering case of the abuse of authority and the need to speak truth to power, and the essential ideal that no one is above the law. The debate between Hillel and Shammai in Chapter 6 is a classic in Jewish tradition, encapsulating the conflict over lenient and strict interpretations of the Law, between liberal and conservative, progressive and fundamentalist. Chapter 7's dispute between the Vilna Gaon and the Baal Shem Tov similarly speaks to the conflict between head and heart, between intellect and emotion, between study and prayer, and offers two sides of Judaism that are each in their own ways worthy of celebration. The debate between Spinoza and the Amsterdam Rabbis in Chapter 8 regards in unblinking manner a dark moment in Jewish history, where one of the greatest of modern philosophers, and one of the founders of the Enlightenment movement, was excommunicated for his views--this chapter alone is worth the price of the book! Barry Schwartz explains that he took part in tournament debate as a high school student, and his love of the form is present throughout the volume. Despite the sometimes tragic consequences of the conflicts that took place, Rabbi Schwartz makes it clear that "debate is more than a valued intellectual exercise in Judaism. In echoing the divine process of creation, it is a holy act." His introduction and overview of the tradition of "arguing for the sake of heaven" would serve as an excellent text for religious studies courses, adult education, and is an absolute must for anyone interested in moral theology or a dialogical approach to religious experience. In future posts, we will feature other items that you might be interested in, that can be purchased online, and please feel free to share with us a review that you have written, or write one for us to share here of books, music, movies, or any other type of Judaica. New beginnings. New challenges, New motivation. NewCAJE. New Year. I am a new blogger. I am Annice Benamy, Religious School Director at Congregation Adas Emuno. I am humbled to have been asked to be a contributor to the Blog. I will try to have something worth reading that will spark some motivation and inspiration to learn more. This is my new beginning. One of the highlights of my summer (besides beginning this amazing new position) was to attend NewCAJE. "New" because the "Old" CAJE folded several years ago. "New" because Rabbi Cherie Koller Fox and CAJE participants wanted it back so they created a new organization based on an old one. CAJE stands for the Coalition for the Advancement of Jewish Education. It encompasses all denominations of Judaism including Reform, Conservative, Orthodox, and Renewal. Each year a different university is chosen to host the four day conference. Participants come from all over the country (this year we represented 31 states and 2 countries) to study, learn, worship, play, sing, network, and eat. My first CAJE experience was in Atlanta, Georgia in 1986. I was teaching in Cleveland, Ohio and wanted to really get involved in Jewish education. My mother, who is my absolute role model, was involved in Jewish music education and she encouraged me to attend CAJE with her. It was such a fabulous experience that I attended the next CAJE at Ohio State University in 1987 again with my mother. Not only did we attend, but we served as an airport service. This is where I met my friend and brilliant musician, Craig Taubman. We offered to pick up Craig and his band at the Columbus airport and bring them to CAJE. A friendship quickly formed and 25 years later I am still inspired by his musical greatness. I also got to sing with Debbie Friedman in the CAJE Chorale the same year. New motivation: NewCAJE was just as fabulous as CAJE. After arriving at Newark airport on Sunday from a family work/vacation in Arizona, my daughter, Ilana, and I went to Montclair State University for our Jewish education week. Ilana was the official NewCAJE Photographer. In four days I took workshops on Administration, Text Study, Technology, New Ideas for Traditional Schools, Great Jewish Debates (Rabbi Schwartz's new book), Creative Torah Teaching, Madrachim Training, Taste of Trope, and Intensive Mitkadem Hebrew Training. We heard concerts from Cantor Doug Cotler, Baal Shem Tones, Six13, Kenny Ellis, New Voices of Noah Aronson, Naomi Less, Jay Rapoport, Eric Komar. But the "cherry on the top" was the 40th anniversary of Kol B'seder - Rabbi Dan Freelander and Cantor Jeff Klepper. Who are they you ask? On Friday Shabbat, we sing "Shalom Rav." They wrote that song. Other songs they wrote that we sing are "Haporais Sukat Shalom" and at Silent Prayer "Oseh Shalom". They contributed much of the contemporary music we sing today. With Debbie Friedman, Kol B'seder paved the way for musicians such as Craig Taubman, Dan Nichols, and Josh Nelson. New challenges: Jewish education is alive and well in the 21st Century because of the new professionals entering the field. Jewish education is changing day by day because there are new ways of doing things. I learned to keep an open mind, be flexible, take risks, and remember our work is for our students at any age. I learned that our biggest blessing is that we can study Judaism together every day. I look foward to you joining me in 5773 for new beginnings, new challenges, and new motivations. Situated in Bergen County, just over the George Washington Bridge, and only a few miles away from New York City's Broadway theater district, Congregation Adas Emuno joins with so many others all around the world in saying rest in peace to Jewish-American composer and songwriter Marvin Hamlisch, 1944-2012. 0:13 -- Tote Board: Actually an enormous video screen so that the people in the back and balcony seating can see better. 0:32 -- Holiday: This concert took place in the month of September, so the holiday Marvin is referring to is Rosh Hashana. 5:26 -- Adon Olam: While Marvin is known for composing many hits, Simon's most noted composition is "Adon Olam", which was a #1 hit in Israel and is performed today at synagogues throughout the world. 6:33 -- Sedaka: Neil Sedaka had done a Beth Tzedec concert with Simon shortly before Marvin's. 6:41 -- That's where we met: Simon & Marvin first met when they performed together in London's "Live At Her Majesty's" in the 1990s. 9:06 -- Marvin's hand: Marvin not only agreed to perform this song but threw himself into it wholeheartedly. By the end, you can see that he is Mr. Song-and-Dance. What a wonderful man. He will be missed!! Funeral and visitation information are available on his official website, http://www.marvinhamlisch.com, along with his a wealth of information on his life and works. Truly, the lights on Broadway have grown a little dimmer with his passing. Olympian Aly Raisman's Rabbi Says Her Gold Medals Inspire Jewish Community reads the headline of an article written by Jaclyn Reiss for the Boston Globe on August 8, the day after Aly won two Olympic Medals, one Gold and one Bronze, for her spectacular showing in women's gymnastics. The rabbi of the Newton synagogue where Aly Raisman attends said he and the Jewish community have been proudly looking on over the last few weeks as she has made her way to Olympic glory. The Raismans joined Temple Beth Avodah, a reform synagogue, in Newton about 15 years ago, and put Aly through Hebrew school starting when she was in pre-school all the way up until her Bat Mitzvah at age 13, said Rabbi Keith Stern, who has been at the temple for 16 years. "I would say her family is a very proud Jewishly-connected family, in terms of their sense of who and what they are," Stern said in an interview Wednesday. "It reflects on what they do in the world and on their basic values." Stern said that he has known Raisman since she was a little girl, and praised her caring personality. "Truly, from pre-school on, she has always been a sweet, confident, very focused person, who always comes through and who cared about other people," Stern said. "She has a natural inclination to make sure people are okay and to make sure they're happy." He also said that Raisman's personality traits shone as she served as captain and led the American gymnastics team to gold. "Watching her during Olympics, she is the perfect captain because she has this ability to look at the group and make sure everybody is okay, and does it in a way that’s so natural for her," Stern said. "I think it significantly reflects the idea that being a Jew is worrying not just about your own immediate family, but also the people you’re with - their welfare, their needs. That’s a significant reflection of a Jewish upbringing." Stern said he liked Raisman's choice of "Hava Nagila," a popular Hebrew folk song associated with celebrations, as the background music of her floor routine. She tied for 3rd place, but lost the Bronze Medal on the tie-breaker, coming in fourth on that event, although she did receive a Gold Medal as part of the USA's fab five winning the Women's Gymnastics Team event (where she also did a floor routine to Hava Nagila). But on August 7th, she won the Bronze Medal in the balance beam final, and then went on to win a Gold Medal in the floor final, once again to the tune of Hava Nagila! NBC isn't allowing us to embed the video, but you can watch her amazing performance on their Olympic coverage site. He said the version Raisman used "rocked the way she needed it to rock," and speculated that Raisman might have used it to pay tribute to the 40th anniversary of the 1972 terrorist attack on 11 Israeli athletes at the Munich Olympics. "In a way, it indicates Aly’s Jewish life is so integrated into her entire soul, that I don’t think she was looking to make a statement as a Jew," he said. "I think it was so natural to her that it's more like, why wouldn’t she use the Hora? It shows again her confidence and tradition in a really fundamental way." Stern said he thinks Jewish Americans feel connected to Raisman, and have been cheering her on at the Olympics. Rabbi Jay Perlman of the Temple Beth Shalom in Needham hit a similar theme in a recent blog post, mentioning the song she chose and her connection to the community. In his blog post, Rabbi Needham also said that "a number of people have commented that they found it refreshing that Aly chose 'Hava Nagila' for her floor routine….. that Aly so proudly shared her Jewish identity with the world." But by refusing to hit the pause button for a measly 60 seconds, Roggue and other organizers have committed a sin nearly as grave as denying there was ever a Holocaust. Were it not for young Aly and her wedding dance/bat mitzvah accompaniment, the Munich dead may have never gotten their due. “I am Jewish, that’s why I wanted that floor music,’’ Raisman said. “I wanted something the crowd could clap to, especially being here in London. Aly Raisman was not alive when the Black September Palestinian militant group infiltrated the Olympic Village at the 1972 Munich Games, but on Tuesday, the 18-year-old gymnast said she would have supported a moment of silence in their honor. In light of the 40th anniversary of the tragedy -- which resulted in the death of 11 athletes and coaches -- relatives and supporters of the Munich victims had redoubled their efforts to have a moment of silence observed during the opening ceremonies in London. But in a decision that drew widespread criticism, International Olympic Committee President Jaques Roggue refused to allow any such remembrance, announcing in May that the "IOC has officially paid tribute to the memory of the athletes on several occasions," and would not be doing so in London, according to USA Today. However, after Raisman mounted the podium to accept her individual gold medal in the women's floor exercises Tuesday, she showed maturity and poise as she addressed the Munich controversy head on. “If there had been a moment’s silence,” Raisman said, “I would have supported it and respected it," the New York Post notes. For many, the gymnast's routine, which was performed to the traditional Hebrew folk tune, “Hava Nagila,” added an extra layer of poignancy. The Jewish community has rallied around the young star, much as it has other athletes who have found their own ways to honor their fallen peers. Fabien Gilot, a French swimmer, made headlines with his own moving tattoo tribute. The Hebrew lettering on his arm: אני כלום בלעדיהם, meaning, "I am nothing without them," was a tribute to a Jewish grandfather figure, Gilot said. The Italian delegation also made its own moving gesture of solidarity earlier in the games, holding a minute of silence with a number of Israeli representatives inside the Olympic Village, Haaretz reports. Zinger thanked the Italians and explained to them that his committee is doing everything to memorialize the 11 Munich victims as Israelis. However, he said, it is important to remember that they were also Olympic athletes, coaches and judges who were murdered during athe Olympics. To Italy, we send our most heartfelt grazie tanto, grazie mille! Before the start of the games, a petition with more than 107,00 signatures, including that of Barack Obama, was presented to Roggue in London, asking that he reverse his decision and allow the moment of silence to be observed. Raisman’s eyes opened as wide as the gold medal she would win when the judges announced her score of 15.600 points after her mistake-free routine. Her top finish was the first by an American woman in the Olympic floor exercise, and the win gave Raisman her second gold medal. 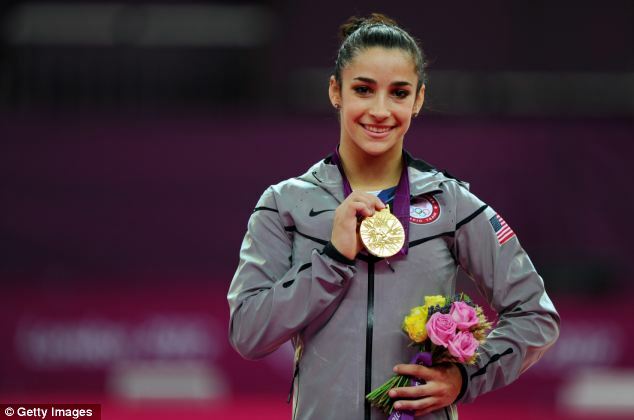 Raisman admitted the 40th anniversary of the Munich Games made her “hora” gold even more special. “That was the best floor performance I’ve ever done, and to do it for the Olympics is like a dream,’’ Raisman said. Raisman did not go to the Games with the star power of her teammate Gabrielle Douglas or the résumé of world champion Jordyn Wieber. But those who know her best said she works as hard as anyone, and, more importantly, her heart is in the right place. She is a focused person,” said Rabbi Keith Stern, spiritual leader of Temple Beth Avodah in Newton Centre, Mass., where the Raisman family are members. Stern said he remembers picking up young Aly from preschool, and never imagined she’d be some sort of megastar. He described the US team captain as a big sister-type who is a mother hen to all her younger siblings. “I can’t wait to have her at the temple to talk about her experience,” he said. Stern said that he, too, was stunned by the IOC’s refusal to hold a moment of silence. Stern said he watched the routine and was blown away. Even so, he said he is more proud of Raisman’s gold mettle than he is of the new jewelry around her neck. “I have to say, the statement just warmed me to the very depths of my being,” Stern said. He compared it to the iconic black-power, raised-fist protest made by track stars John Carlos and Tommie Smith on the medal stand at the 1968 Mexico City Games. Stern, in an interview Wednesday, added: "I think we’re all puffing out our chests as far as we can go - we’re all so proud of her," he said. "Jewish people often do this - if something happens to another Jewish person, it becomes personal, and now every Jewish family feels related to Aly in some sort of unique way, and feels pride in her success." "The idea of a highly-trained, highly-successful athlete really reflects a kind of pride of who and what we are as Jews living in the world today, particularly as American citizens," Stern said. And when Raisman finally steps off the plane from London next week? "I’ll be in line to greet her with Wheaties and Sports Illustrated," Stern laughed. "We’ll be waiting at the temple whenever the Raismans are ready to join us." And there she is, showing us her Gold Medal, Alexandra Rose Raisman, one of America's, and Reform Judaism's, finest atheletes! Mazel tov, Aly, mazel tov! Have you seen our entry in Parent Guide News? If not, maybe you should go take a look, as it's online as well as in print. According to their website, Parent Guide News "caters to expecting parents and families with children up to 12 years of age. The monthly columns and feature articles in our ten regional parenting magazines, as well as online, address both global and local parenting concerns, such as health, education, pregnancy, child-rearing and much more. Congregation Adas Emuno is a Reform congregation whose goal is to strengthen within its membership the bonds of faith and community and instill within its children the sense, history and responsibility of growing up in a Jewish community. A dynamic clergy team, led by Rabbi Barry Schwartz, along with a creative religious school staff and actively engaged membership, help them realize that goal. They offer a positive Reform Jewish experience for families with children of all ages, providing free high holy day children’s services, monthly Family Shabbat Services, Sunday morning religious school for grades Kindergarten through Confirmation, and creative programming for younger children . For the 2012-2013 school year, families with young children can look forward to fun activities like apple picking for Rosh Hashana and Super Sukkot Family Day in September, Chanukah Celebration for Tots in December, Arts and Crafts at the Jewish Museum in January, and hammantaschen-making for Purim in February! Please visit the temple website for more information. Join them on August 19 from 2-4pm for a “Meet and Greet” ice cream social. Congregation Adas Emuno is proud of its long history serving the Bergen and North Hudson County communities since 1871. Now, why don't you just see what it looks like on their page anyway, just click here, go there, and let us know what you think. As the new president of Congregation Adas Emuno, I want to begin by saying that it is a great honor to be asked to serve our synagogue in this capacity, and it is also a hefty responsibility. Our little shul has been blessed in the past with outstanding leaders like Beth Ziff and Virginia Gitter, and our immediate past president, Alan Spector, under whom I served as Vice-President, and the example that they set stands as a model, and an inspiration. We remain a warm, intimate, and welcoming synagogue. We are open, pluralistic, diverse, and accepting. We are proud of our long history, dating back to 1871—we are a part of Jewish history, and we continue to make history year after year. We are committed to the Reform movement in Judaism, and we are innovators in our own right. We are a do-it-yourself, hands-on congregation, where everyone has the opportunity to participate, if they so choose. We are a progressive community devoted to the happy marriage of faith and reason. We are a center for the spiritual, the intellectual, the educational, and the musical. Our religious school is our temple's precious jewel, and continues to be of the highest priority for our leadership. It was my privilege to serve as chair of the search committee for our new school director, and I am grateful to Amy Chartoff, Annette DeMarco, Rebecca Kind-Slater, and Rabbi Schwartz for their participation as committee members. Through diligent and deliberate efforts, we were able to identify several outstanding candidates, decide upon our top choice, and successfully hire her. Annice Benamy is hard at work as our new Religious School Director, and we are looking forward to an exciting year for our children and teens, one that includes new initiatives such as family education and the long-awaited formation of a youth group. Adas Emuno is, literally, an assembly of the faithful, and our religious community has never been stronger. Over the past year, we have been fortunate to enjoy the vital and inspiring spiritual leadership of Rabbi Barry Schwartz. And we look forward to another year of sacred observance of Shabbat, holidays and festivals, and the High Holy Days as Rabbi Schwartz is joined by our new student cantor, Allison Lopatin. In past years we have had many enjoyable, enlightening, and meaningful events, social gatherings, concerts, screenings, adult education sessions and social action efforts. In the coming year, we will continue to expand upon these programs. The rabbis tell us that when we die and go to heaven, God will not say to us: Why weren't you as great as Abraham or Moses? However, God will ask us: Why weren't you the best person that you yourself could be? And likewise, collectively, we don't have to ask: Why aren't we like Temple Emanu-El in New York City, or the Touro Synagogue in Rhode Island. But we do have to ask: Are we the best Adas Emuno that we can be? Renewal. This applies to our buildings and facilities, to our school curriculum, and to our liturgy as, for example, we adopted a new prayer book this past year. It includes a renewed sense of spirituality of the kind that motivated experimentation within the Havurah movement, and in more mundane terms, a re-examination of our policies and procedures. Innovation. As a small shul, we have the advantage of flexibility, and we need to make good use of it. To be the best Adas Emuno that we can be, we must remain true to our 4,000 year old tradition, and also to the progressive values of the Reform movement. And we have to take advantage of the new media, social media, and emerging technologies that are available to us (speaking of which, have you friended us on Facebook and liked our page, followed us on Twitter and Google+, subscribed to us on YouTube, and do you read our blog?). We must be a synagogue for the 21st century. Planning. The Yiddish proverb, mentsch tracht, Gott lacht, meaning man plans, God laughs, reminds us that the plans we make can only be tentative. But it doesn't mean that we shouldn't bother planning. Of course, we have to attend to the day-to-day needs of our temple, but we also need to engage in long term planning, consider contingencies, and look to the future of our congregation as well as the present. Fundraising. There is no avoiding it. We cannot rely on the charity of strangers. But we can find new, creative, and entertaining ways to help support our synagogue. Membership. Congregation Adas Emuno is not a place. It's not the property, not the buildings, not the plaques on the walls, not even the prayer books, Ark, and Torah scrolls, important as they may be. Adas Emuno is us, the assembly, the congregation, the people, the community. Without members, Adas Emuno is nothing more than history, a past without a future, without a present. Our presence breathes life into our synagogue, and to remain alive, we need to renew our membership. Recruiting new members isn't easy, and we need your help. We need your word of mouth, we need you to reach out, we need you to spread the word, talk us up, invite potential members to a Shabbat service or special event, let them know who we are and all that we have to offer. Publicity. When it comes to getting the word out, nothing beats word of mouth, but we can amplify our efforts through publicity. Adas Emuno is perhaps the best kept secret in the Bergen County Jewish community, and it's time for that to change, time to stop hiding our light under a bushel, as the saying goes. Listening. I want to know what your thoughts are about our temple. I want to hear your ideas. And I want to encourage your involvement and support your efforts. Over the coming year, I hope to meet with members of the congregation in small, informal groups, to listen to what you have to say, and find out how we can work together on behalf of our congregation. Congregation Adas Emuno is an extraordinary, altogether unique, and beautiful spiritual community, a place where we join hands in praying for healing and in service for those in need, where hearts and minds work together in hamishe cooperation to create something for ourselves, something that is greater than ourselves. As your new president, I pray that I am worthy of the trust that has been placed in me, and that at the end of my term, we are at least a little bit closer to being the best Adas Emuno that we can be. 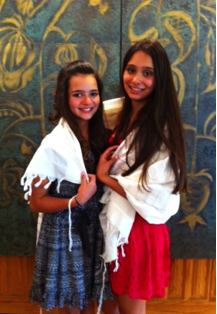 Congratulations to the Arang family on the Bat Mitvah of Lily and Emma Arang on June 2nd! For our mitzvah project we decided that we would donate money to the National Ovarian Cancer Coalition. We had debated over many different ideas, but after hearing about the loss of Stefanie Jacobowitz, we wanted to donate in her memory. Stefanie was diagnosed with ovarian cancer and quickly after that the cancer spread. This just showed how deadly ovarian cancer is. We donated 5% of all our gifts to the National Ovarian Cancer Coalition. On behalf of Congregation Adas Emuno we offer our gratitude for their good deed in loving memory of our fellow congregant, Stefanie Jacobowitz.